Popular German New Cinema auteur Margarethe von Trotta (The Lost Honor of Katharina Blum, Rosenstrasse) has always had a peculiar proclivity for taking beauteous blonde Aryan actresses and making them seem as sexually unappealing, frigid, and soulless as possible, turning Fassbinder’s leading lady Hanna Schygulla (The Marriage of Maria Braun, Lili Marleen) into a pedantic feminist literature professor in her film Sheer Madness (1983) aka Heller Wahn and statuesque beauty Barbara Sukowa (Berlin Alexanderplatz, M. Butterfly) into the most horrendous of Hebrew hag communists in Rosa Luxemburg (1986) aka Die Geduld der Rosa Luxemburg, the latter of which she received the German Film Award (Bundesfilmpreis) in 1986 for her bizarre philo-Semitic efforts, so it should be no surprise she did the same for her latest flick Hannah Arendt (2012), albeit with more interesting and surprising results. Once again featuring Barbara Sukowa in the lead aesthetically degrading role of a historically controversial butch Jewess, Hannah Arendt is a Hollywood-like biopic that depicts the controversy regarding German-Jewish philosopher Hannah Arendt’s groundbreaking book Eichmann in Jerusalem: A Report on the Banality of Evil (1963), a work written for The New Yorker that not only offended world Jewry due to its depiction of National Socialist SS-Obersturmbannführer (lieutenant colonel) Adolf Eichmann—a naughty Nazi who fled Germany after the Second World War and was dubiously captured by members of the Israeli Mossad and ultimately executed in 1962 via hanging after being found guilty of ‘crimes against humanity’ and ‘war crimes’ at an Israeli show trial that was a major media event—as a boring bureaucrat who did not genuinely hate Jews and was merely ‘following orders’ in his deportation of Jews to concentration camps as if he was the manager at a fast food restaurant like McDonalds, but also because she revealed the imperative role that Jewish leaders, especially Zionist Jewish leaders (who wanted Jews out of Germany just as much as the Nazis and sent to Palestine), had in voluntarily collaborating with the Nazis during the holocaust. To add to the hostility felt by her fellow Hebrews, Arendt was also the protégé and mistress of German philosopher Martin Heidegger, who joined the Nazi Party (NSDAP) on May 1, 1933 and never expressed an inkling of regret nor remorse for being arguably the greatest ‘National Socialist’ thinker who has ever lived. A sort of real-life ‘Romeo and Juliet’ story among philosophers, Arendt kept in contact with Heidegger for the rest of her life, even after he become a Nazi and she spent a brief period of time in Camp Gurs concentration camp in Vichy, France before escaping to America, and her relationship with the Aryan philosopher sparked her famous concept about “the banality of evil” where evil acts are not typically carried out by psychopaths and sadists, but ordinary people who are brainwashed by the state and consider actions they carry out for the government—no matter how deplorable—as normal. 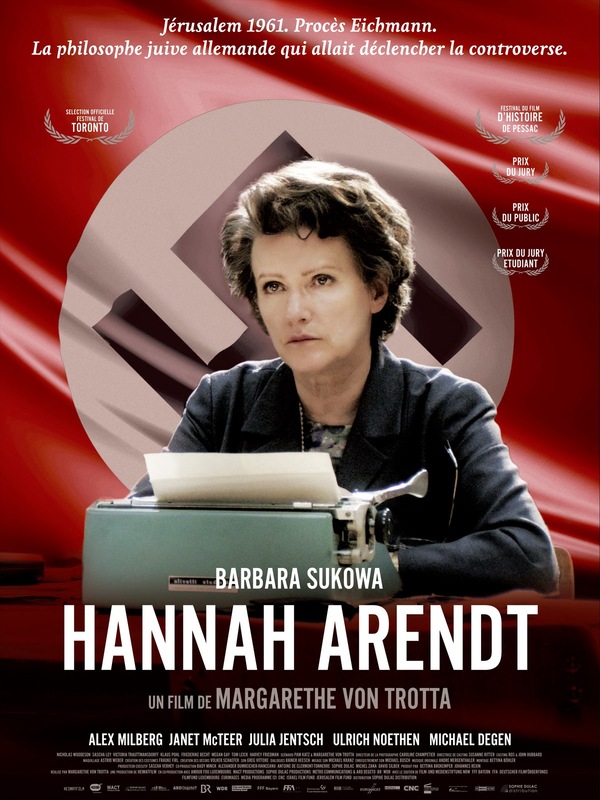 A German-Luxembourgian-French coproduction ironically released by a production company called “Heimatfilm”, Hannah Arendt is a fiercely formulaic flick that looks like it could have been directed by a sorry shabbos goy Hollywood hack like George Clooney, yet considering its unflattering portrayal of Israel and its hypocritical Hitlerite-esque tactics, von Trotta’s film could have never been made in Hollywood despite it depicting arguably the greatest female Jewish philosopher of all time. Hannah Arendt (Barbara Sukowa) smokes like a chimney but when she takes the job of reporting on the war crimes of Adolf Eichmann for The New Yorker, cigarettes become practically her only real friends as she learns that criticism of the Jews in any context, even if you're a holocaust survivor, is nothing short of Hebraic heresy. Being named the first female lecturer at Princeton University in 1959, Arendt is a prestigious philosopher who is also happily married to a kraut cuckold communist poet/philosopher named Heinrich Blücher (Axel Milberg), but her life was not always so grand as she was forced to flee her birth nation of Deutschland in 1933 for Paris to escape from Uncle Adolf and she even stayed in a Vichy, France concentration camp as an “enemy alien” after Germany took over frogland, but she eventually escaped with her hubby and mother to New York City in 1941, where she became actively involved with the German-Jewish community and after the Second World War even became involved with the Zionist organization Youth Aliyah. As depicted in von Trotta’s Hannah Arendt, Arendt, an uncompromising individualist with no need for a superficial collective identity, got over her reactionary flirtation with Zionism and had no problem with factually implicating many bigwig Jewish leaders in collaborating in the holocaust while covering the Eichmann trial. While at Eichmann’s trial in Jerusalem, Arendt notices that the big bad SS man “doesn’t scare me at all. He is insignificant” and he “speaks in horrible administrative jargon,” thus being far from the sinister Satanic SS man that threw Jewish babies off moving trains like the mainstream American and Israeli media portrayed him to be. While Arendt confides in her Israeli friend Kurt Blumenfeld (Michael Degen)—the the secretary general of the World Zionist Organization from 1911 to 1914—that “Israel must ensure that it doesn’t become a show trial,” she is more than a little bit let down by her people’s exploitation of Eichmann as a sort of scapegoat for Jewish/Zionist (in)action in regard to the holocaust. 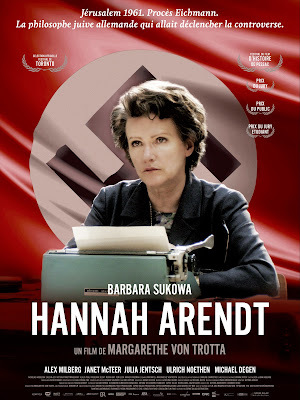 While certainly no masterpiece, Hannah Arendt is easily one of the best biopics I have ever seen on an intellectual figure, even if it is a bit aesthetically banal, as it demonstrates that Hannah Arendt was a rare German-Jewish thinker of courage who, despite being technically a ‘holocaust survivor’ and having the potential to milk her Jewishness to further her career, stoically sought philosophical truth, proving that not all men that do monstrous things are monsters and, indeed, the cowardliness and/or greed of Jewish leaders played a imperative role in Jewish suffering during the Second World War. As someone who has read Eichmann in Jerusalem (1963), it is quite clear to me why Hollywood has never directed an Arendt biopic as the book basically discredits a good portion of the ‘holocaust narrative’ as depicted in films like Schindler’s List (1993), where the Nazis are virtually portrayed as demonic disciples of the devil himself and all Jews are portrayed as morally immaculate angels in kosher form. While I cannot say I have ever had much respect for Margarethe von Trotta or her films, I must admit Germany’s foremost female auteur surprised me with Hannah Arendt as she demonstrated that she is not just an ethno-masochistic and philo-Semitic feminist as demonstrated by works like Rosa Luxemburg (1986) and Rosenstrasse (2003), but also a rare modern day Teutonic filmmaker who has the gall to portray not only mainstream leftist academia, but especially the Hebraic nation of Israel, as being true blue hypocrites who just as slavishly follow orders as Mr. Banality of Evil himself, Adolf Eichmann. Additionally, von Trotta also refrained from portraying Martin Heidegger as an evil Nazi, but instead as a wise and loving man who was not exactly the greatest genius when it came to politics. While it is probably unlikely, I would not mind seeing Ms. von Trotta direct a biopic about Leni Riefenstahl as it might be rewarding to see how the most famous contemporary female German filmmaker depicts easily the most (in)famous female filmmaker—be it German or otherwise—who has ever lived.